I lived on this island for nearly 10 years. The peoples' may not ( think) they are able to live side by side - but are friendly, everywhere. Ahhh Cyprus, we love it! myself, wifey and daughter have been a number of times over the last 6 or 7 years, was there last in August and September last year. We have been all over the island including the Turkish sector, which was actually a really nice experience, crossing the border and all that. We've done all the touristy things, followed the green line, visits to the ghost towns, Farmagusta, Salamis, Varosha, the historic stuff Paphos etc, the greek nights, cruises, hired speedboats and swam at places like Cape Greko and Aphrodite's Rock and much much more, too much to mention. The place is amazing, the people are very nice and friendly, food is great, amazing sandy beaches and the weather fantastic too, they drive on the proper side of the road, the left, just like us! they use British 3 pin plugs, what is there not to like about the place. I am currently semi retired, but plans are to take early retirement later this year if all works out with selling of businesses etc and if that happens my wife will also give up work and we will spend 3 - 4 months during the winter in Cyprus, can't wait! Ahhh Cyprus, we love it! myself, wifey and daughter have been a number of times over the last 5 - 6 years, was there last in August and September last year. We have been all over the island including the Turkish sector, which was actually a really nice experience. We've done all the touristy things, the green line tours, visits to the ghost towns, Farmagusta, Salamis, Varosha, Paphos the historic stuff, the greek nights, cruises, hired speedboats and swam at places like Cape Greko and Aphrodite's Rock and much much more, too much to go into. The place is amazing, the people are very nice and friendly, food is great and the weather fantastic too, they drive on the proper side of the road, the left, just like us! they use British 3 pin plugs, what is there not to like about the place. I am currently semi retired, but plans are to take earlyt retirement later this year if all works out with selling of businesses etc and if that happens my wife will also give up work and we will spend 3 - 4 months during the winter in Cyprus, can't wait! I have hired them mainly in Protaras, Fig Tree Bay area and travelled along the coast South to Cape Greko and the radar station on the cliffs, can't really go much further that way unless you have lots of time. Can't really go much North from there obviously because of the Turkish guards patrolling the sea and land / beach area around Farmagusta. Yes it's an amazing place! we are off to Ukraine in June for 3 weeks, but hope to get back to Cyprus maybe August / September time, dependant on daughter going to Uni etc. If we go to live over winter, we have already made our minds up to base ourselves in the Paphos area, lots to do around there and easy to travel to most parts from there also. dependant on daughter going to Uni etc. What does she hope to study ? Yes it does, she has been accepted (subject to A level results) at Lancaster, Manchester and Leeds universities, Lancaster is her preferred one though, it has an excellent reputation and ranked highly, she was there Saturday as it happens on a taster day. She will be doing business and finance. However, she has just done a weeks work experience at BAE, only two from her college got approved, she has applied there also for an apprenticeship in Project Management and Finance, she loved it, she has got through 3 stages so far and interview is next, if she gets offered a job there she will take it, it would be silly not too, getting paid to do a degree and with all the opportunities that are available to her there is a no brainer, it is always well over subscribed but so far so good. Chris regards to your wife and congrats for daughter. Have been to Cyprus 3 times, travelled a lot around, including the North, have relatives there.... and I agree with Chris that Paphos is more interesting place, huge contrast from the North....but I liked Kyrenia and the very cheap fresh fish.by the port. I can only guess that Moby is staying in the North so I have something for you. PS: Moby first time I saw you writing something interesting and not been belligerent or PIA. Great to see how well the little 'un's adapted. I know about Lounes, thanks and the (London)Derry lass who has just won a test case in Belfast - allowing her US hubbie to reside in the UK - using the 2004/38/EC route - she was told she was 'British' and couldn't but pointed out the agreements of the Good Friday Agreement and that she chose to be Irish .. Thanks Wiz, yes there are many places that are worth visiting, the lovely weather helps of course. Time, goes quicker than we realise, especially if you are having fun ......we are away later this month / early next month for a few days, reason is, we have been married 10 years this month, blimey! Re: Why Cyprus is a GREAT place to go with a FSU partner - normally peaceful ! Police Sirens and then gun shots ? There ensured a 'Crime of passion' as the furious husband - apparently' made his wife stab the lover ( the landlord) and the neighbours attacked the attackers ..got it ? The Police arrived and fired into the air to disperse the revengeful neighbours.. I found this from an Azerbaijan ) newspaper. 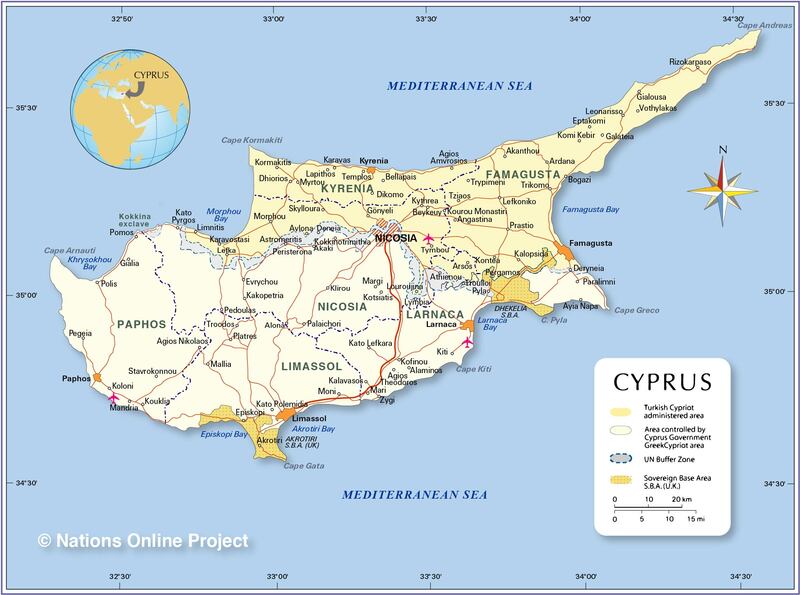 After 10 years most places change a lot - but not Cyprus... it is stuck in a rut - while both 'sides' blame each other, when it is clear that it is time a new generation try to sort things out between them ....the problem being - will Turkey 'allow' it ? Frankly, I find this part of Cyprus to be more western and tidy - but it has got v.expensive. The Kremlin has threatened to recognise the 'TRNC' - the 'north' but will it - given it's ties with the Orthodox Christian 'south' ? Have you spoke to any Turkish Cypriot born in the north? Before the invasion there was only 80.000 and now with the colonisers are nearly 400.000 and the TC hate them. Thanks to Kissinger and the UK. Divide and rule. !